The flavor of McCormick Dill Weed is subtle and fresh. Dill Weed has a taste that is sweet, green/grassy, tea-like with rye notes. The Dill plant is an annual of the parsley family and is related to anise, caraway, coriander, cumin, and fennel. Dill Weed is the dried leaves of the dill plant. 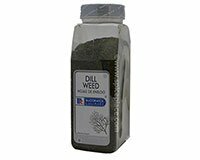 Use Dill Weed is used as a flavor for soups, salads, seafood such as lobster or crayfish, stuffings, and dips. Use to marinate 1 pound boneless pork, chicken, turkey, or fish. Blend in blender. Add 1/4 cup heavy cream and chill; also good served hot. Dilly Vegetable Dip More Recipes..